The New York Times is reporting that RIM has been found liable of infringing software patents held by Mformation Technologies. There goes $147 million in damages for the BlackBerry manufacturer—more cash it can't afford to lose. 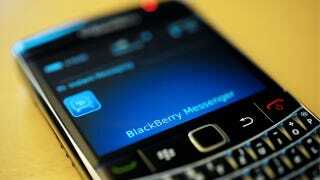 The company claimed it had disclosed details of the technology to RIM during licensing discussions. After declining to take a license, the BlackBerry maker modified its software to include the patented systems, Mformation said in its complaint. RIM denied wrongdoing and said the patents were invalid, according to court filings.